Starhill Gallery and Lot 10 kick start Chinese New Year in the best fashion to celebrate the Year of the Snake. 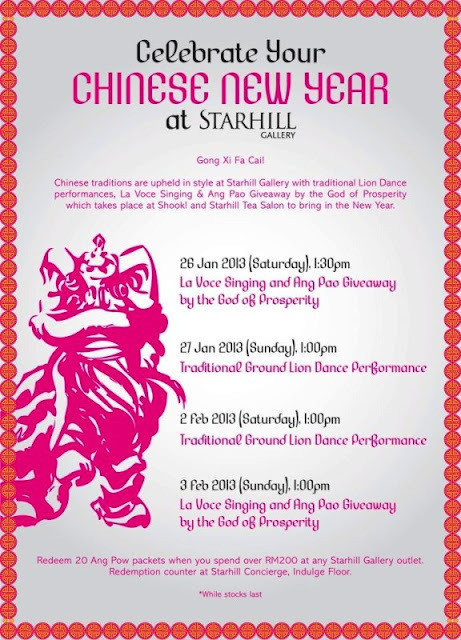 The spirit of Chinese New Year comes alive with a range of special performances, including from the 57 time world champions of Lion Dance, Kun Seng Keng Lion Dance Association. In addition to the traditional Lion Dance performance, customers can also bring in the new year with the god of prosperity and the traditional beat of 24 festive drums. This year’s good fortune can be spread to family members and friends with uniquely designed Ang Pow packets. They are redeemable at Lot 10 and Starhill Gallery for customers who make a purchase over a certain value in a single receipt. Those who spend RM100 or above at Lot 10 are entitled to receive 10 packets while customers who spend over RM200 in Starhill Gallery in a single receipt can receive 20 customized Starhill Gallery packets.